Reviewing a new Iron Maiden album is always a bit of a balancing act. On one side, there’s the unbridled excitement over THE MAIN EVENT® that is, simply, new material from these legends of the metal genre. On the other, there’s the need to temper that excitement and judge that material fairly, with the understanding that, in most cases, the band’s best days are behind them. And while that may have made digging into the band’s latest effort, The Book of Souls, a bit of a process, the album’s got enough meat on its bones to pass the test. Aside from the fact that it’s a double album, Souls has a lot in common with its two immediate predecessors, A Matter of Life and Death and The Final Frontier. Stylistically, it still bears the mark of a classic heavy metal band exploring its progressive side, and at times, it still goes a bit too deep into that exploration. The big difference is that it’s often much livelier and more compelling in doing so. More often than not, the songs gravitate less toward the interminable, plodding, bass-driven introductions we’ve come to associate with post-reunion Maiden, and more toward capturing your interest in short order. You see the pattern here, don’t you? In many cases, the biggest reason for Maiden’s success hooking us in here is that we’ve heard variations of these songs before. And that’s both a good and a bad thing here. On the downside, Maiden’s hardly ever been a band to pull an AC/DC or Motörhead and retread past material — so to see them do so here, even if unintentionally, is a bit of a disappointment. On the other hand, the songs end up being pretty fun listens, for the most part! For a band about to wrap up its 40th year of existence, that’s nothing to turn your nose at. Look, I get it: as a concept, as a composition, and as a display of pure ambition, the album’s 18-minute closer is 100 percent worthy of your respect. The song describes the 1930 R101 airship crash in France, and incorporates a piano-driven intro and outro, a smattering of different orchestral flourishes, and even a Morse code S.O.S. signal set to music. Bruce Dickinson didn’t need to try to write a song like this, but he went for it anyway — and it’s incredibly admirable seeing long-established legends pushing themselves like this. But it’s just. too. long. That S.O.S. signal — the song’s defining moment — comes after seven minutes of piano balladry, and commences more than eight minutes of more traditional Maiden rock-out. Come on, guys — “Paschendale” covered similarly weighty subject matter twice as effectively in less than half the time! These gripes aside — okay, these gripes and the fillerific “The Man of Sorrows” aside — The Book of Souls ends up being a decent listen. It’s a clear step up from the last two albums, and the band sounds tighter and more cohesive than they have in years. (Particularly Dickinson, who turns in a more forceful, versatile vocal performance than we’ve heard from him in a decade, if not longer.) It’s not a “great” Maiden album, or even a “very good” one, but in the end, there’s enough here to keep you coming back. And for a 40-year-old heavy metal band, that’s no small thing. 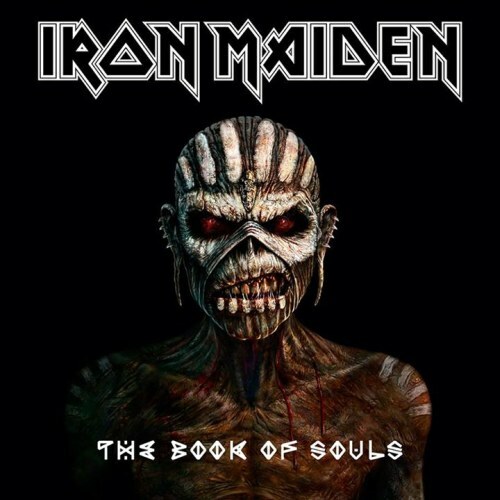 The Book of Souls is available now via Parlophone Records. For more information on Iron Maiden, visit the band’s official website. Next Article CANTO: Save Metalocalypse! Other stuff, too!